Yes, folks, it's true. Dr. R.C. Sproul, who I've always thought to be a straight forward thinker and teacher, has now made truth even more clear -- in the form of children's books. My parents were big R.C. Sproul fans when I was growing up and my teenage years were filled with his video series and books. If it sounds like I'm complaining, let me assure you that I'm not! I was one of those interesting teenagers who loved reading about and debating theology. (Yes, it's true. People would say to me that I should go to law school. So when I grew up - I did!) I've spent the better part of the last few years training the bulldog out of me and developing in grace and discernment. It's something I will have to work on for a long time, no doubt, but it's a goal. I did not become so dogmatic because of R.C. Sproul's teaching. Rather, I always found him to take a gentle and kind hearted approach to teaching scripture, while at the same time being incredibly insightful and assuming the best of his students. He assumes his public can handle the truth and so he goes about sharing it. Therefore I was positively delighted to discover that he had written some children's books. 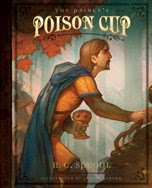 The Prince's Poison Cup is a new release and is an allegory in which the king's only son must drink from a polluted and poisoned well in order to clean the water and make it fit for all the people to drink. It's a simplistic allegory on the one hand. On the other hand, some people try so hard to make simple gospel truth complex that the gospel gets written right out of the story! Not so in The Prince's Poison Cup. It's spot on. The Lightlings is yet another allegorical tale of redemption, starting in the Garden of Eden. In this story children come to understand that while they might be afraid of the dark, ironically there are others that are afraid of the light. I found this particular story engaging and imaginative and was my favorite of the two books I've read. I really like the way that Sproul weaves his tale to both engage the child mind while instilling truths as they read along. The only drawback (if you consider it to be one!) that I took from these two books is that it is the grandfather figure who shares the stories involved in these books. No apparent problem there but the grandfather is the one to whom the parents in the book transfer the responsibility of sharing truth with their children. In both books the child asks a question that the parent decides that grandpa will do a better job answering. I don't necessarily mind this (on the whole) and I do appreciate the fact that we are to respect our elders and learn from them. My beef, if you will, is that children should be able to ask their parents the tough questions and find their answers there. To rephrase that - we as parents have a duty to learn truth so that we can teach it to our children. In a roundabout way, Sproul is giving us additional tools for parents to use to teach their children scriptural truths. I'm just giving you a "warning" about this particular aspect of the book and I don't personally consider it disturbing enough not to read and love with my own kids. I enjoy children's picture books with morals attached. Jesus Himself taught us through parables so I'm all for finding new ways to share ancient truths. I think Dr. Sproul has done just that and I'm as pleased as anything to recommend them. It's hard to find children's literature that teaches solid Biblical truth without dumbing it down. Dr. Sproul again assumes the best and appeals to the best within the child to grasp the information and for that, I am incredibly grateful. Again.